Our Amish handcrafted rustic red cedar log bedroom furniture is built to last. The beauty of our red cedar wood can not be denied and is a customer favorite here at DutchCrafters. 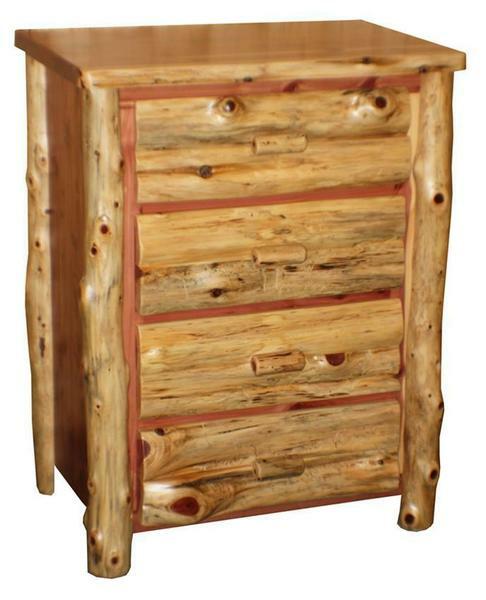 This Red Cedar Four Drawer Log Chest of Drawers can also be substituted for a bedside nightstand. Add a protective varnish to your finished chest of drawers to help protect it from damage and to keep it in great shape so you and your family can enjoy it for generations. Please call one of our Amish furniture specialists for additional information or custom ordering assistance on this beautiful rustic Red Cedar Log Chest of Drawers. Check out our beautiful Rustic Red Cedar Log Bed or the Amish Red Cedar Log Captain's Bed to complete the look for your bedroom furniture.